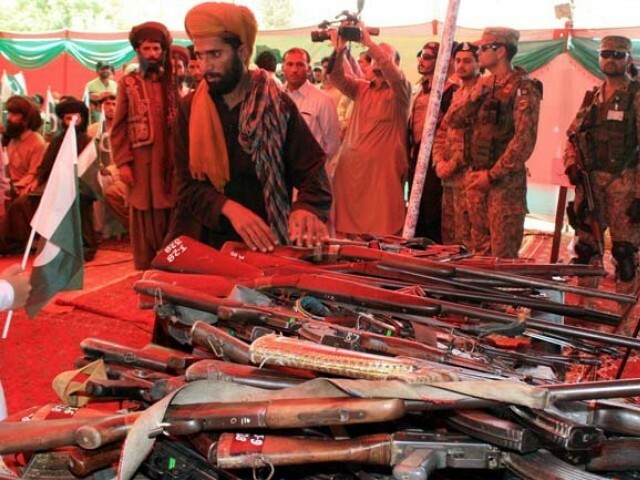 QUETTA: A large number of Baloch militants surrendered their weapons to government authorities in the provincial capital on Tuesday. According to details, the 265 former militants pledged their allegiance to Pakistan and promised not to indulge in anti-state activities in future. The ceremony was attended by Balochistan Chief Minister Jam Kamal Khan, officials from the armed forces, including Commander Southern Command Lt Gen Asim Saleem Bajwa. Also present in the ceremony were inspector general (IG) Balochistan, IG Frontier Corps and other senior officials. In August 2017, 12 militants from the Baloch Republican Party (BRA) surrendered themselves to security forces in Noshki area of the province. It was reported that the reconciliation process started under the National Action Plan (NAP) against terrorism and has borne fruitful results in the restive province. Militants who give up violence have been offered cash support and jobs to help them lead a violence-free life.